Be a Leader! Follow the Sun. Do an honest appraisal of yourself and your actions. Let your actions have the energy and power of the Sun, to burn away the Darkness and bring Enlightenment. Develop courage, self confidence and remain transparent and righteous in conduct. Let us not hesitate to set a benchmark for a wholesome society. The Educationists need to ponder over the Moral fabric of society, which stands shattered on account of the heinous crimes committed by educated people. The dire need of the hour for the DAV institutions is the need to create an environment for academic and social development of its learners, to strike a balance between the materialistic and spiritual aspects in a learner’s life and change the mindset. Let’s rethink the expectations we have from our children- make them impeccable human beings, with qualities of head and heart, rather than being job oriented. The Chairman of the School, Shri. B.S. Bahl is a symbol of Humanism, a Gem of person whose wisdom has given direction and definition to DAV CMC, New Delhi. Under his singular guidance, the School has flourished and established itself as a leading DAV Institution. Principal Madhu Bahl has become a torchbearer and is carrying the tradition forward. I have a deep impression of her compassionate and her all-round personality. I am very impressed by the students, staff and the leadership of this school. 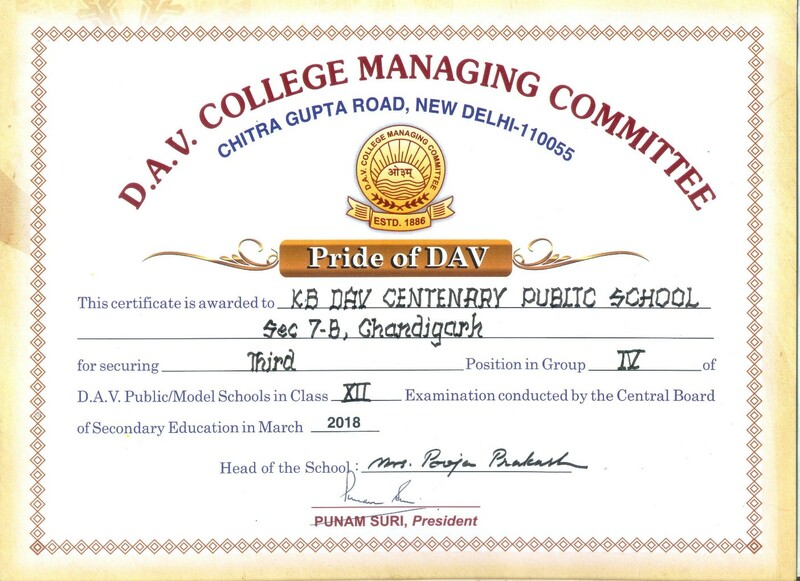 KBDAV-7 has hit several milestones on its journey to being one of the leading DAV institutions in the Tri-city. Principal Mrs. Madhu Bahl’s focus on continued excellence and providing high quality of education is a major accomplishment. I have been impressed by the level of the student engagement, both in scholastic and co-scholastic areas. I would like to congratulate the Principal and Staff on their hard work and accomplishment.